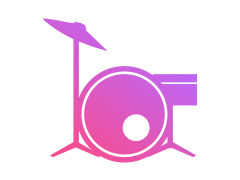 We're two musicians based in central London with original songs looking for a reliable Drummer to form a band initially for live gigs in small venues and eventually hopefully gain a recording contract. Must be able to perform in a wide range of styles (rock, indie, pop, funk, electronic etc...) using songs that compete well & stand out . This is an unpaid job as of now. We've many of our own songs - ranging from quiet ballads to loud electronic and rock / post-punk pop styles (which currently exist as rough demos). We'd want to join with serious, ambitious, dedicated musicians in view of reaching a professional standard. We welcome all members own songs / styles / influences / input / ideas / opinions. We believe realistically the best way to start is for both parties to arrange an informal rehearsal to see how everyone gets on (splitting costs for the hire of space). N.B. Early days. It will not be a complete band to begin with as we'd all be looking for other musicians - everyone needs to support each other & start somewhere! Thanks.